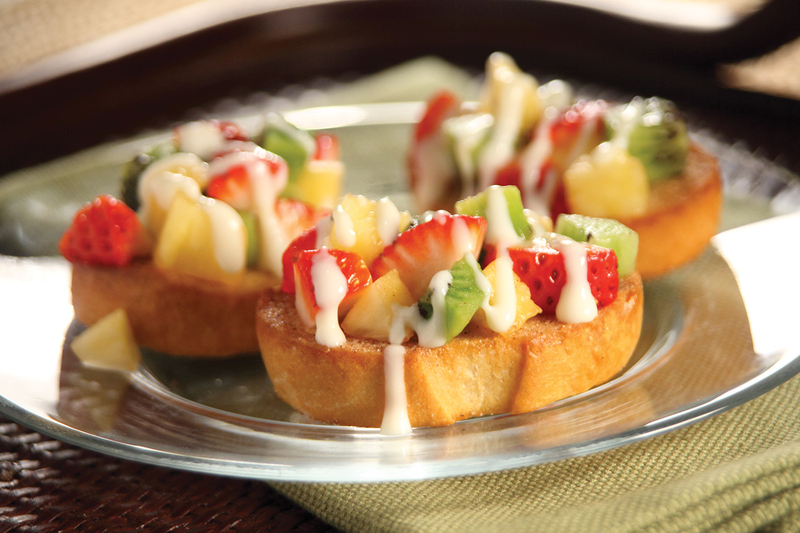 Celebrate Spring with this easy to make Fruit Bruschetta, delicious and bursting with flavor. Slice crusty rolls into 1/2-inch thick slices. Place on a baking sheet and brush with melted butter. Combine sugar and cinnamon and sprinkle over slices. Bake at 400 degrees F 5-10 minutes or until edges are toasted. Set aside to cool. Place strawberries, pineapple and kiwi in a bowl and toss gently to combine. Place about 1 tablespoon fruit mixture on top of each toasted roll slice. Combine sour cream, honey, lemon zest and lemon juice and mix well. Drizzle over fruit.